WAYNE GLOWACKI / WINNIPEG FREE PRESS ARCHIVES Bob Brown, CentrePort project co-ordinator, said there are no plans to rezone Little Mountain Park. Revamping the zoning regime in the RM of Rosser to allow for CentrePort development is now underway and will likely see about 445 hectares of land changed from largely agricultural to industrial use. An open house and public-design review was held this week as part of the process that will allow for industrial development within the CentrePort lands that fall within the RM of Rosser. The area designated for the first zoning update -- north and south of Inkster Boulevard and west of Brookside Boulevard -- is the most developed to date and the area where there is the most demand from developers. Bob Brown, CentrePort project co-ordinator for the RM of Rosser, said he was pleased with the results of two meetings held this week each with about 70 to 80 people in attendance. "We were looking to accomplish two things -- a draft amendment to the current Rosser zoning bylaw to more reflect the CentrePort vision and we wanted to get some recommendations on design standards that could apply in the first instance in the targeted area." The design standards would not apply to the buildings in the industrial parks north and south of Inkster that have already gone up, but they might eventually become standardized through the CentrePort footprint. Although there have been concerns expressed that existing green space -- including Little Mountain Park and the Players Golf Course -- would somehow be compromised in the process, officials from the RM of Rosser and CentrePort stressed that would not be the case and they would remain green space. Brown said Rosser's zoning bylaws have been in place for about 25 years -- most of the land is zoned agriculture or limited agriculture or highway commercial -- and are not suitable for the development that is occurring and contemplated for CentrePort. "CentrePort is meant to be an industrial development so it's not profound to say we're looking at different categories of industrial zoning," Brown said. The exercise in establishing a new zoning protocol in the RM of Rosser is part of a larger process to make the whole CentrePort area into a seamless development plan for both the lands in the RM of Rosser and the CentrePort lands that are part of the City of Winnipeg. "Part of the CentrePort intent is to have planning provisions in place that allow streamlined and efficient administration of the process that's not encumbered by a lot of red tape," Brown said. "We're striving for zoning that is well-defined but easily spelled out and something you could work with without an overabundance of complications in applying it." 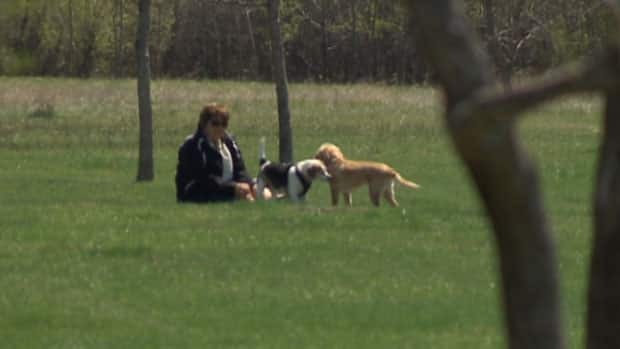 When it comes to the green space such as the City of Winnipeg-owned 65-hectare Little Mountain Park, north of the Players Golf Course, there are no plans to rezone that. Brown said if at some point the City of Winnipeg or the owners of the Players Golf Course decide they want to sell the land, it would have to go to a public hearing process. People who use the dog park that's within Little Mountain Park have expressed concern that somehow industrial development will encroach on those lands. But an official from CentrePort said, "The city says it is protected. I don't know what else to say. The land-use plan is to protect that green space. CentrePort has (8,093 hectares). It does not need Little Mountain Park's (65 hectares). It's just not needed." Brown said the plan is to come back with a draft review of the recommended new zoning bylaws in September for further public consultations with the final product finished in October. I did an interview with CBC, here is the story. We are asking the community to get involved in a number of ways. The consultant team ofPlaceMakers, MMM Group, and CNT will be conducting interviews in June with selected entities most closely involved with the first phase of CentrePort Canada. We are looking to identify potential opportunities and issues with a zoning framework outline. Then, in July open houses, we will ask planning officials, the business community, and residents to consider ideas and actions to help guide the RM of Rosser and CentrePort towards a future of increased opportunity. We will gather and refine ideas about subdivision design, connectivity, parcel sizes and uses, as well as the ultimate form and function of the area when fully developed. Monday, July 22, 4:30-6 pm. This is a community input open house, setting the stage for zoning and design. The planning team will give a summary of the June interviews, and ask for additional public direction on functionality that you would like to see enabled by the new Rosser CentrePort zoning framework. This event will be held at the Community Hall at Grosse Isle, 0117E - PR 321, in the R.M. of Rosser. Thursday, July 25, 5:30-7 pm. The design team will take the combination of Monday's input along with intelligence collected in May and June, and spend the week developing a framework for the CentrePort Design Standards and Phase 1 Stage 1A Zoning Designations. We'll ask the community for direction to refine ideas and provide a mid-course correction. This open house will be held at the Community Hall at Grosse Isle, 0117E - PR 321, in the R.M. of Rosser. During August and September, the planning consultants will be drafting the zoning framework, under the guidance of the Steering Committee. Once the first draft is complete, we will host another open house in the fall for additional community input. The preparation of a form-based zoning framework will accommodate immediate development proposals in Rosser and is intended to also be transferable to future phases of CentrePort development, in both Rosser and Winnipeg. A Steering Committee with representatives from Rosser, Manitoba Local Government, and Winnipeg’s Planning Department is working with the consultant team to provide ongoing professional and technical input throughout the project.